Every time I walk past this shop window I fall in love. 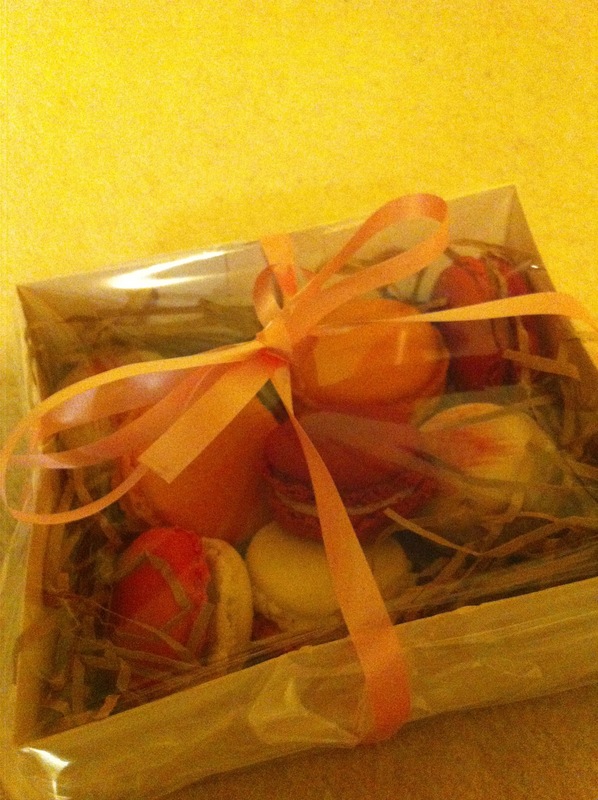 Little macaroons (which everyone keeps raving about), very delicate pastries and gorgeous looking cakes. The price is pretty up there and after a few days of indulging in the Cake Boss TV series, I really really wanted me some delicious bakes. But I was disappointed. When I get an impulse I'm sure my friends and family could tell you that theres no stopping me, even money is no boundary. I just go a bit crazy. And so I did. 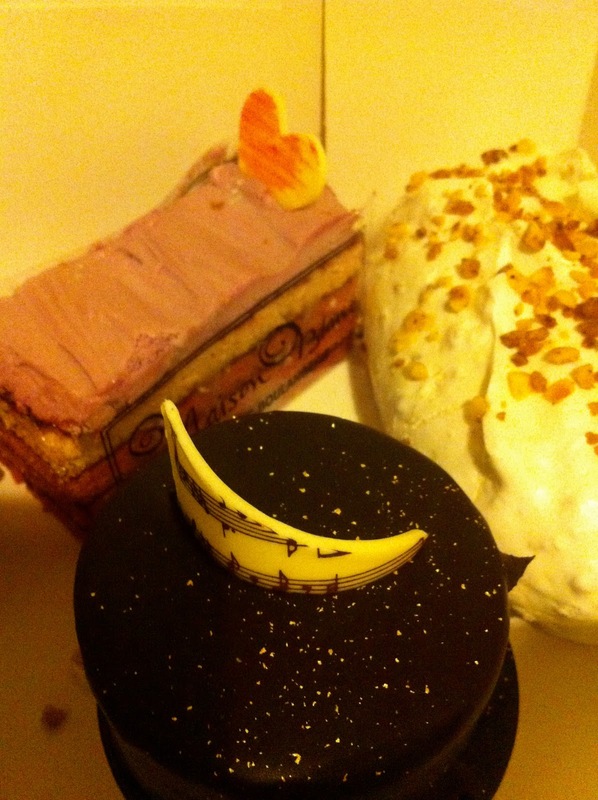 I spent £22 on these desserts, which with my student budget is probably why I was so disappointed. More to the point, I got there 1 minute before they closed and luckily they let me in, so I didn't really have many options to choose from at 6pm on a Friday night. But hey, I was there and had some major cravings. 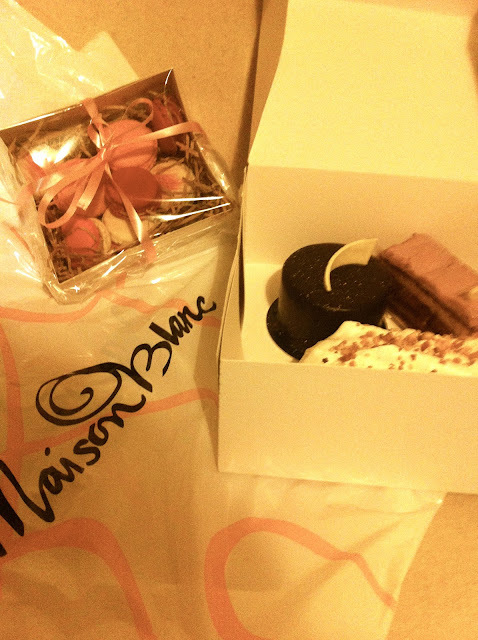 So I picked the prettiest looking and of course the infamous macaroons. (I did try to bake these before as so many bloggers have) Let me tell you. They may look great in pictures, but the truth is in the bite. They need to be crunchy on the outside and a viccy sponge texture in the middle. These were as such, but wow was it an almond overload. Very bitter and I didn't realise these were stuffed with some strange fillings. 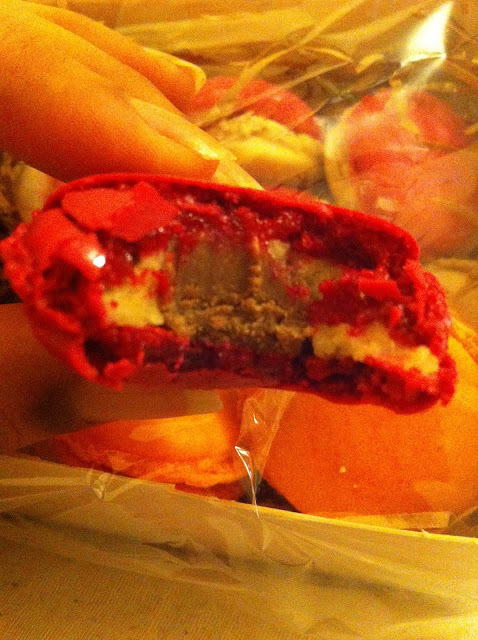 To say the least I don't like macaroons. As cute as you are little fellas, I wont be ordering any more. Although I must say they are beautifully packaged. I'm not slating this bakery. Being myself only an ammeter baker at best, their cakes and bakes are amazing. Very well executed with what you can see is a lot of skill and attention to detail. But they just weren't to my taste. The chocolate or what the lady described to me as a ferrero rocher type cake, was just not. It was made with a very rich dark chocolate, which I'm not really a fan of. Then filled with a crunchy almost kit-kat like texture. The crunch was gorgeous, the mouse light and fluffy. But just too bitter for me. 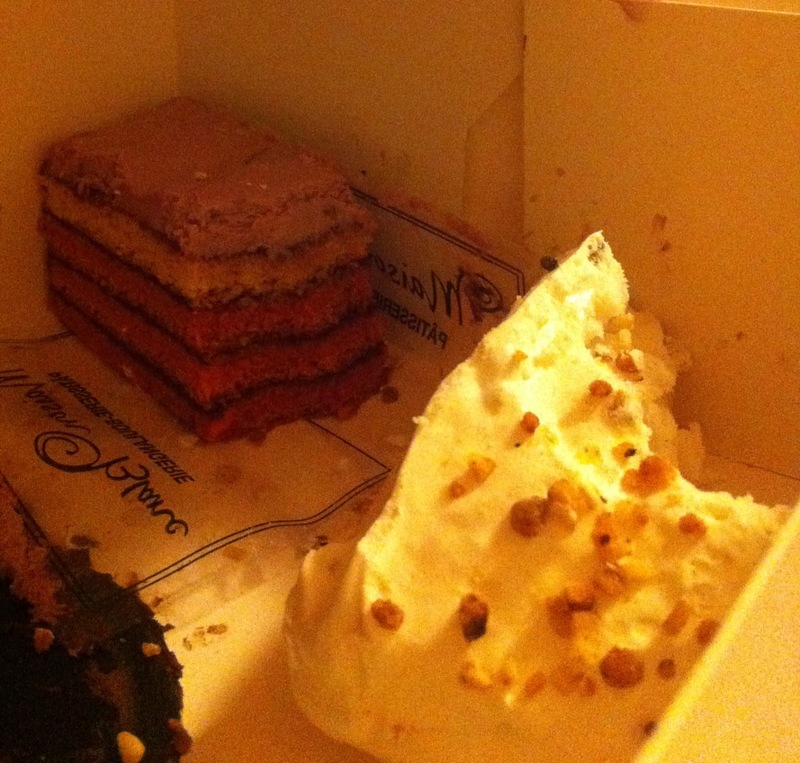 On to the cherry layered cake, it was so well made. The butter cream on top had a sharp distinct cherry flavour which I love! 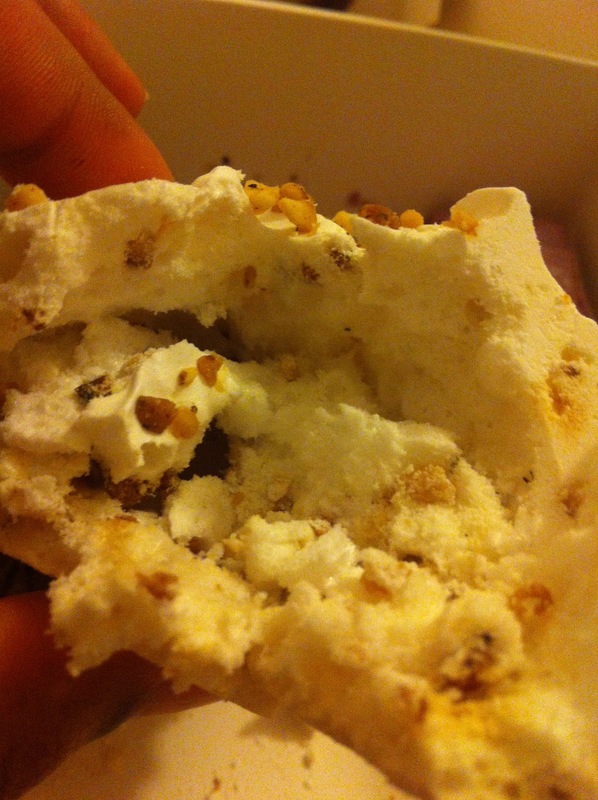 I'm a big fan of meringues and never really seen any sold just separately like this. So I had to see. I'm not quite sure how I was supposed to eat this one, so I just took it as it was. Stabbed in my teaspoon, the outside was amazingly crisp but the inside gooey and filled with nutty praline. A definite winner to share with coffee. Have you tried any new patisseries lately, which are your favourites? oooh they look yummy. I haven't tried anything from a patisserie recently, but I am just about to eat an apple crumble. Enjoy your treats!